Turns out Cookie Monster doesn't just eat cookies, he bakes them, too. Cookie Monster's famous lines like "Me want cookie! ", "Me eat cookie! ", and "Om nom nom nom" left us thinking all he did was scarf them down. 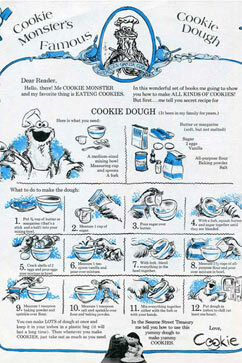 But Cookie Monster's very own original cookie recipe has now resurfaced. It first appeared in the 1970s in " Big Bird's Busy Book." And contrary to popular belief, Cookie Monster's favorite cookie is not chocolate chip. He apparently prefers good old fashioned sugar cookies. "Dear Reader, Hello, There! Me Cookie Monster and my favorite thing is eating cookies. In this wonderful set of books me going to show you how to make all kinds of cookies! But first… me tell you secret recipe for Cookie Dough (It been in my family for years.)" 1. Put 3/4 cup of butter or margarine (that's a stick and a half) into your mixing bowl. 5. Crack open two eggs and pour eggs over mixture in bowl. 12. Put dough in icebox to chill (at least one hour). Cookie Monster says you can make lots of dough at once, and save it in a plastic bag in your freezer for future baking. However, he must have been preoccupied, eating all the dough before he got around to including the baking time instructions. Thankfully TheKitchn.com comes to the rescue, recommending rolling out the cookies 1/4 inch thick, sprinkling with sugar, and baking at 400 degrees.